Cherukunnu Annapoorneshwari Temple, also known as Cherukunnilamma Temple, is the only Durga temple in Kerala where Parvathi Devi Mahamaya is in ‘Annapoorna Bhavam’ (Mother of all meals). ‘Annam’ in Malayalam language means ‘food’ and ‘Poornam’ (purnam) means full. The meaning of the Bhavam Annapurna is one who gives food to every needy without restriction. The idol is with a ladle in one hand. 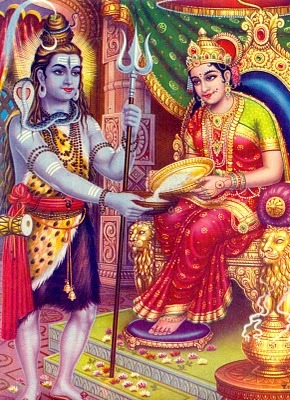 Annapurna is the goddess with a golden ladle. Sree Annapoorneshwari Temple is situated in Cherukunnu, 15 km from Taliparamaba, in Kannur district of Kerala, India. As the name Annapoorna indicates, Annadhanam (free food distribution) is a very important offering to the goddess. The food, rice with at least one gravy curry is given to the devotees as the prasaadams. This temple gives food to all devotees who come here for worship and want to take food. Food is offered two times, during lunch and dinner every day. The chuttambalam – naalambalam surrounding the sanctum sanctorum is vast to take care of the dining place (Outta Pura) for the devotees to partake the food offered. The temple is acclaimed as offering food in abundance to those who come here to worship. Cherukunnu Annapurna Temple was supposed to have been built during the 5th century AD. This temple is the principal deity worshiped (family deity) by the erstwhile Ruling family of Chirakkal. The temple was renovated by the Avittam Thirunal Valiya Raja. The present form of the temple is more than century old. A Punah Prathista was done in the year 1994 on the Pooyam star day of Kumbha Masa of Malayalam era. Situated next to Cherukunnu Temple on the right side is the temple pond (Ambala Kolam). The pond is of about 2.5 acres in area and is called as Chira. The temple pond will always have water at a very high level. In the center of this Chira there is a stambham – pole. The pond – chira has four major entrances. On the south west side of the pond there is shelter. This sheltered portion of the pond is exclusively for the use of the priests (poojarees). Cherukunnu Annapoorneswari Temple is in a beautiful locality called Cherukunnu with back waters around a large portion, and in the midst of hills with greenery all around. The temple is located in a village about 3 km from town. Cherukunnu is in Kannur District. This is a very famous temple of Kerala and especially of region formerly known as the Malabar. 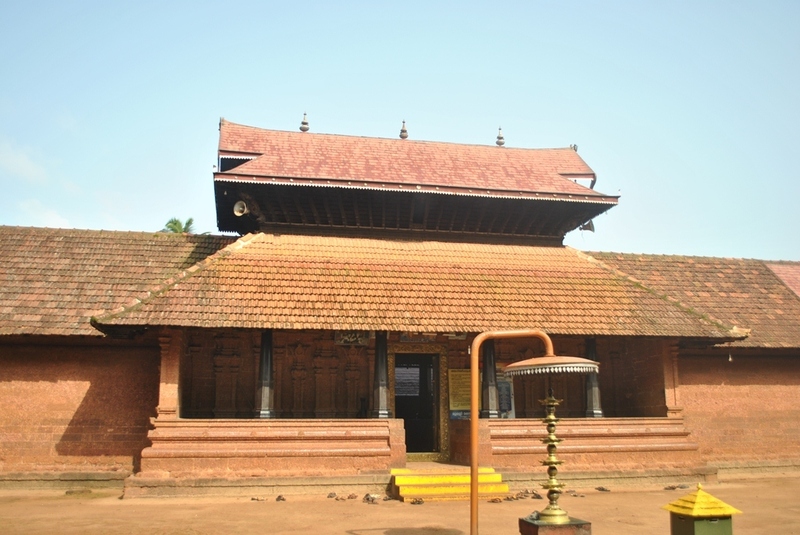 The belief about the structure of the temple is that the same is made of polished stones bonded with a mixture of flattened rice and jaggery (Avil and Vellam). Cheru means small or little and kunnu means hill that is small hill. Around this place there are five small hills. Hence the place got the name Cherukunnu. There is a Mythological version, according to which a heap of cooked rice is made 'choru kunnu', to offer to the people who come here for their par-taking the food prasaadams (Annadhanam). The word 'Chorukunnu' later changed into 'Cherukunnu'. The main festival is the Vishu Vilakku in April every year. This is celebrated for a full week with spectacular fireworks and performances of other forms arts. The Prathistha dinam is observed on Pooyam star day of Kumbha month. Maha Shivaratri, Navami and Ekadasi are also celebrated in this temple. Management of the temple is done by the temple committee under the Malabar Devasom Board. 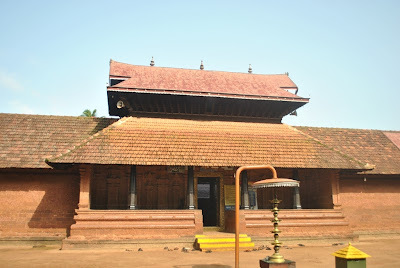 Cherukunnu Temple is 3 km from the Chirakkal Village and 12 km from Thaliparamba. Kannur is at 14 km distance. Buses and autos and taxis are available from major centers of Kannur. Thaliparamba Raja Rajeswara Temple, Payyannur Temple, small islets of Ayiram Thengu and Mungam, Trichambaram Sri Krishna Temple, Kanhirangad Vaidyanatha Temple and Mazhoor Dharmikulangara temple are some of the major Hindu places of worship near Cherukunnu Annapoorna Temple. Thavam Roman Catholic Church is the famous and very old church of Malabar and a heritage place for Roman Catholics. Other churches are the Kattakulam, Paadiyil Ferry and Kavinisseri (Christhukunnu). For Muslims the place of interest in Cherukunnu is the Oliyankara (Oliankara) Juma Masjid. The legend about this Masjid has it that the boatman of the golden ship, who brought the Annapoorneswari Devi and her maids and servants, was asked to wait at Ayiramthengu for their return. Accordingly he waited. When he did not see the Davis he built this Masjid during his waiting period. This is a Guest Post by respected Sri Ramanathan AR Sir now residing at Bangalore, Karnataka in India. If you are interested in postings articles or information about temples in your place please sent them via mail to hindudevotionalblog@gmail.com. We will be posting them in this devotional website under your name.